In 1970, my family emigrated from Burma to the U.S. as stateless refugees following a wave of ethnic cleansing of ethnic Chinese induced by racial and labor strife. Although born in Burma and speaking nothing but Burmese, my sisters and I were considered illegal aliens, as children of war refugees who had fled to Burma from China, which had been invaded by Japan’s Imperial Army. As a child in San Francisco, my teachers taught me the history of Kearney Street—a street in Chinatown named after Denis Kearney, an Irish-American labor activist famous for leading mob violence against Chinese workers who had originally been brought to the U.S. to toil and die while building the Transcontinental Railroad. Racist reaction to these workers who had migrated from a famine-torn China induced the first Chinese Exclusion Act in the U.S. Congress. There is very little new in Trumpism. In healthcare where I work, we would call it “chronic recurrent exacerbation” of a pre-existing malady or condition—the condition of ethnic chauvinism. 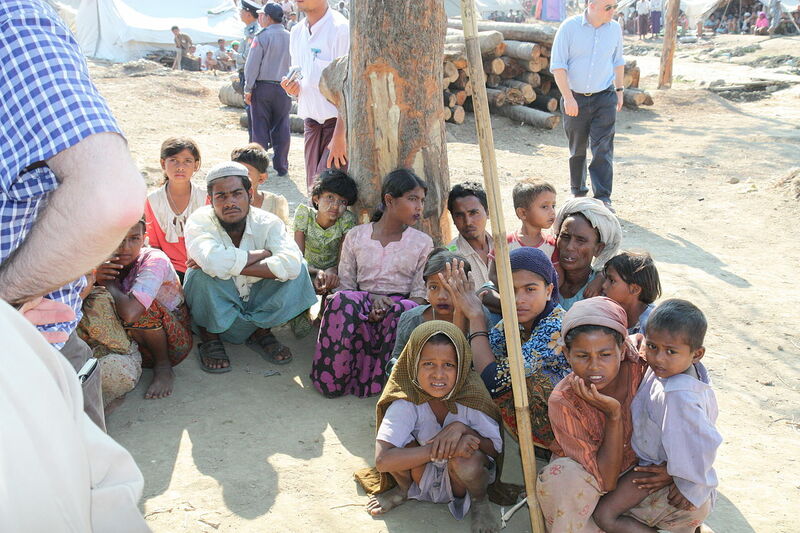 The plight of the Rohingya in Burma helps illuminate the past, present and future of refugee crises. Buddhist cleric Wairathu of Burma has incited mob violence and army atrocities against the Rohingya Muslims with demands for their expulsion to “preserve Burmese culture.” The government ignores centuries of Rohingya history within Burma and considers them all Bengali refugees from the period of the 1947 partition of India as British colonialism was departing. The ethnic minority—refugees often fleeing crisis conditions created by the same forces of capitalist competition also suffered by the ethnic majority—is made a scapegoat. You do not have the luxury of waiting for proper vetting and proper documents if you are like the millions of Syrian war refugees running for their lives with only the shirts on their backs, fleeing death and destruction from bombs and methodical ethnic cleansing rampages like the kind the world has been witnessing in East Aleppo and in the state of Rakhine in Burma. Millions of immigrants are being relegated to the status of stateless refugees. This condition of being stateless as determined by man-made boundaries of statehood, not unfamiliar to Palestinians, is the inhumanity imposed on the Rohingya for generations. Trump is merely exploiting existing racism and supremacist ideology, the ideology of “America First.” It is familiar to African-American Representative John Lewis and anyone who survived the Jim Crow era, the lynchings and ethnic cleansing of a time characterized by the 1921 race riots in Tulsa, Okla., which caused mass migration of African-Americans—plights Rohingya and Syrian refugees are reliving today. Racism and supremacist ideology were central to Reaganism when Ronald Reagan launched his 1980 Presidential campaign with a rally in Philadelphia, Miss., in Neshoba County—well known for the lynching of civil rights workers James Chaney, Andrew Goodman and Michael Schwerner in 1964. The world is currently undergoing a resurgence in retrogression—an exacerbation of a chronic pre-existing condition—of cultural isolationism, and state-sponsored chauvinism. Overcoming this spreading epidemic of narrow nationalism would require each of us to recognize the universal ideological affliction represented by particular ethnic separations and accompanying symptoms and diseases arising from local turmoils. The power of the idea of statehood created these conditions. The power of the idea of human freedom can transcend it. This entry was posted in Articles and tagged 1921 Tulsa race riot, African American, Aleppo, Andrew Goodman, automation, Bengal, Buddhist, Burma, Chinese, Chinese Exclusion Act, Denis Kearney, Donald Trump, ethnic cleansing, freedom, global capitalism, healthcare, Htun Lin, illegal immigration, James Chaney, Japan, Jim Crow, John L. Lewis, labor, lynching, Mexico, Michael Schwerner, Muslim, narrow nationalism, Palestinian, racism, Rakhine, refugees, retrogression, Rohingya, Ronald Reagan, Syria, Wairathu, Workshop Talks. Bookmark the permalink. Very good piece as far as it goes. Your analysis should include the democrat party & their racist policies including internment of the Japanese during WW2,refusal of Europeans (many of them Jews). Reagan picked Mississippi to announce his candidacy to ‘sway'(sic) democrats & their military wing,the KKK. Many of the worlds refugees have been ‘created’ by the murderous foreign policy(ies) of the power sharing capitalist parties. Trump’s reply to O’Reilly regarding Putin killing a lot of people, by saying that the U.S. has as well, has created a firestorm in the pundit class on today’s Sunday talk circuit. Let’s hope that it creates an opening for serious study & debate in the coming years & that we will not have to continually rehash lesser evilism at election time.